Francesc (@francesc) 是 Go 核心团队的一员, 是提倡 Google Cloud 平台的开发者. 他是一个编程语言的爱好者, Google的技术指导大师, Go tour的创造者之一. 这个讨论的灵感来自于另一个 Raquel Vélez 在 JSConf. Slides 的讨论，这个讨论已经发到了这里. Sourcegraph 是下一代编程协作工具, 用于搜索, 探索, 和审查代码. 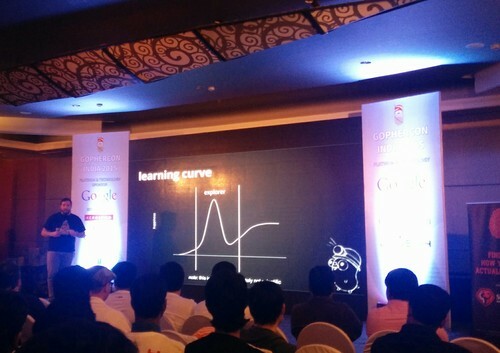 我们参加GopherCon India 来分享我们是怎样使用 Go 并学习别人是怎样使用它的, 对配合liveblog的这次讨论我们深感荣幸. 菜鸟在这个阶段使用Go去创建一些小项目或者玩具项目。他们应该会利用到Go tour, Go playground, Go文档, 和邮件列表(golang-nuts). // calling http.ListenAndServer directly, so that it could be stored in the martini struct for later use. // This would also allow to improve testing when a custom host and port are passed. // Only one directory at a time can be processed, and the default is ".". // Run generate for each type. // Should never happen, but can arise when developing this code. // The user can compile the output to see the error.